Amber earrings, amber necklaces, amber bracelets and more . . .
Handcrafted cross pendant with warm amber. Radiant Amber drops dangle from handcrafted silver earrings. Both earrings contain light- and eye-catching inclusions. Radiant amber earrings just full of inclusions and light catching properties are a handcrafted wonder to behold. Baltic green amber and sterling silver are united in a delicate Celtic inspired cross that is sure to be cherished. Simple yet stunning, this certified genuine Baltic green amber shimmers with bursts of gold. Surrounded in an elegant sterling silver setting that enhances its natural beauty, this pendant appears different every time you look at it. Amber sterling silver pendant in a contemporary design. Handcrafted and one-of-a-kind. Sterling Silver Amber Cuff Bracelet. This is a handcrafted, one of a kind piece. Large hand polished, warm amber stone hangs impressively from a black leather cord. Beautiful Baltic Amber handcrafted with sterling silver--a one of kind piece. This pendant is handmade using an unique piece of amber enveloped by sterling silver. Each piece is lovely and one-of-a-kind. 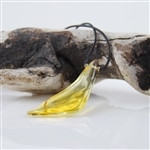 Gorgeous amber pendant wrapped in an elegant silver setting. Green amber sterling silver cuff bracelet boasts a plethora of amazing inclusion bursts. Every angle shows off a different array of colors. Stunning in an elegant, yet exotic, manner. 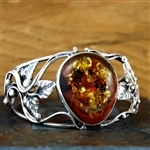 Warm, noble, highly desired Baltic Amber is displayed in an ornate handcrafted silver cuff bracelet.